How can we tell if a patient has had a previous myocardial infarction? I guess we could look for Q waves on their ECG, or for regional wall motion abnormalities on echocardiography. But one of the best ways is using CMR, which shows even small areas of infarcted myocardium with clarity. So how do we do this? 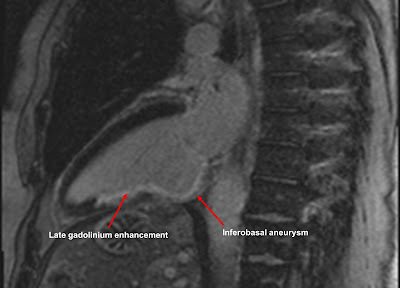 The technique uses gadolinium, an intravenous contrast agent commonly given during MRI studies. In stress cardiac MRI, for instance, gadolinium is used to visualise myocardial perfusion in the assessment of coronary artery disease. When gadolinium is given, it enters normal myocardium quickly and is then rapidly washed out by normal perfusion. If you scan a normal heart ten minutes after a bolus of gadolinium is given, there's normally no gadolinium left behind in the myocardium. However if there is myocardial scar tissue present as a result of an infarction, the gadolinium does not get washed out so quickly. 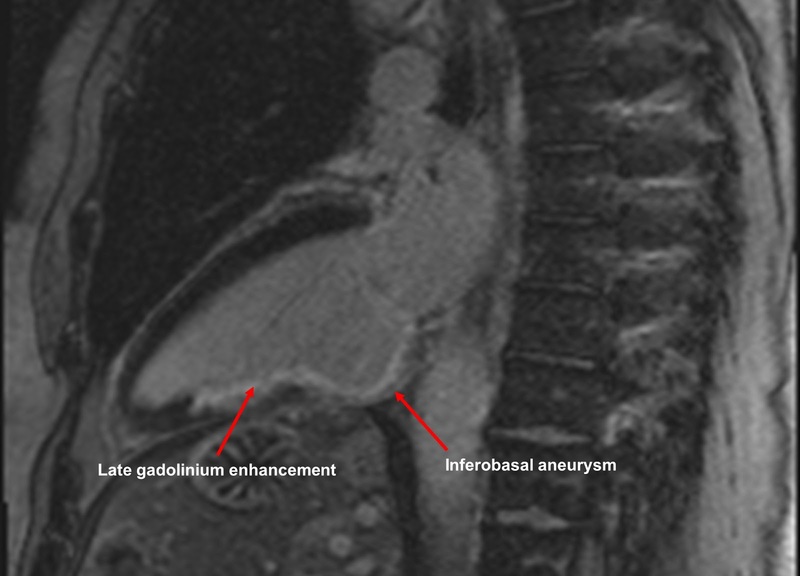 Instead, the gadolinium stays in the infarcted areas of myocardium much longer than normal, and is still visible if imaging is done ten minutes later. So to identify areas of infarction, we give a bolus of gadolinium IV, and then we wait for ten minutes. We then scan the heart to look for 'bright' areas of infarcted myocardium, which indicates that gadolinium is still present. We call this 'late gadolinium enhancement', or LGE. An example is shown above. This patient has had an inferior myocardial infarction in the past, caused by occlusion of their right coronary artery. We can see evidence of LGE in the inferior wall of the left ventricle, corresponding to the area of infarction. You'll also notice a bulge in the basal inferior wall, indicating an inferobasal aneurysm. You'll see that the LGE is subendocardial rather than epicardial. This is because myocardium infarcts 'from the inside to the outside'. In other words, the subendocardium is always involved in an infarction, but the extent to which the infarction extends outwards varies from case to case. In some cases the LGE stays subendocardial, in others it can be 'full thickness'. If you'd like to learn more about the use of LGE in the CMR diagnosis of myocardial infarction, then check out my Cardiac MRI Essentials course at Medmastery.